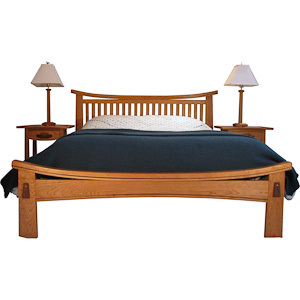 The Rockland Bed blends the tradition of American Mission style with a hint of an Asian architecture. It is what I call my East meets West design or Mission-Asian Fusion (C) Copyright 2008. This signature piece as shown is made from solid Cherry with Walnut inlays on the Header, Footer and Side Rails for accent. This piece matches the same details that can be seen in the Rockland Nightstand. The bed is a platform design and does not require a box spring. I have designed this bed to accommodate all types of mattresses including, but not limited to Tempurpedic (R), Sleep Number (R), latex, etc. The size and thickness of your mattress should be provided at the time you order. Typically I set the height the top of the mattress to the typical height of a chair or around 18" to 22". If you desire to use a box spring this can be accommodated. Please inquire about making the proper adjustments to the bed frame for your mattress and box spring. Also if you prefer bed slats instead of a platform base, please inquire. Last, if your prefer a footer without an arch detail this can be ordered as an option. Click on Picture for other views.